Lady Spring comes to Maine with a soft and gentle step. Each year, she asks us to have patience in the faithful turning of the seasons. She gives us time to experience, anew each year, the gradual thawing of the earth through all our senses, asking us to awaken to every stirring; the return of birdsong, the smell and touch of fresh mud, the flow of melting ice and snow, the emergence of green shoots bravely reaching up to the warming sun. She reveals each spring, in her simple grace and eloquence, the wonders of new life. Being in the presence of young children gives us the gift of newness every day. We are given the opportunity to share in their sense of wonder and to rejoice in their discoveries. Children ask us to stay open-hearted and curious. They ask us to bend, flex, and take joy in beholding the newness of the world through their eyes. 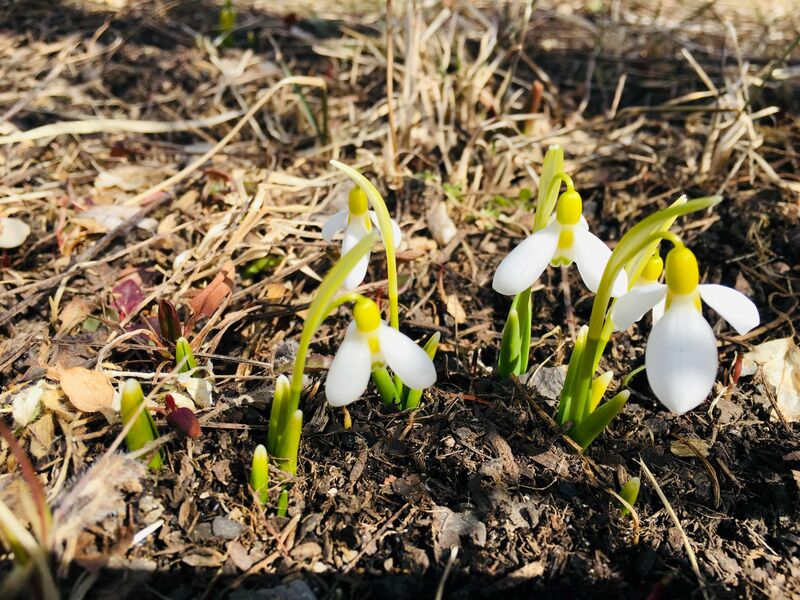 The photo of the snowdrop shoots was taken last week in our school garden. In the meantime, we had three inches of snow, which has since melted. Not to be deterred, these hardy little plants blossomed a few days ago. The snowdrop blossom photo was taken this morning. There is a luminescent glow to these new shoots. I am reminded of being in the presence of a newborn baby. The glow of a newborn, so fresh from heaven, fills the space all around them with a special quality of light. We planted wheat grass in small terra cotta saucers with the children, then watered them well. 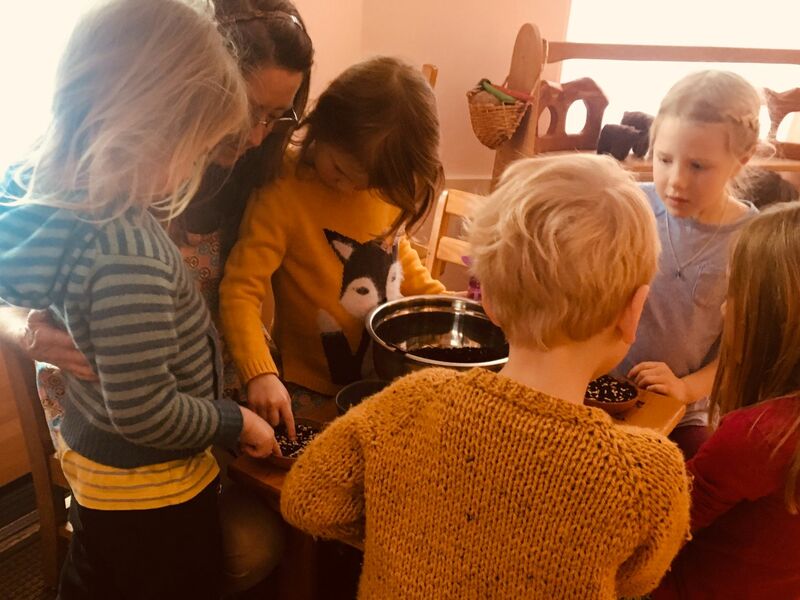 The children found places to nestle the freshly planted seeds around the room and on the small nature table, alongside Mrs.Thaw. The saucers are glazed on the inside, making them fairly watertight for use on the nature table. Late winter and early spring is the time we tap maple trees to collect their sweet sap. 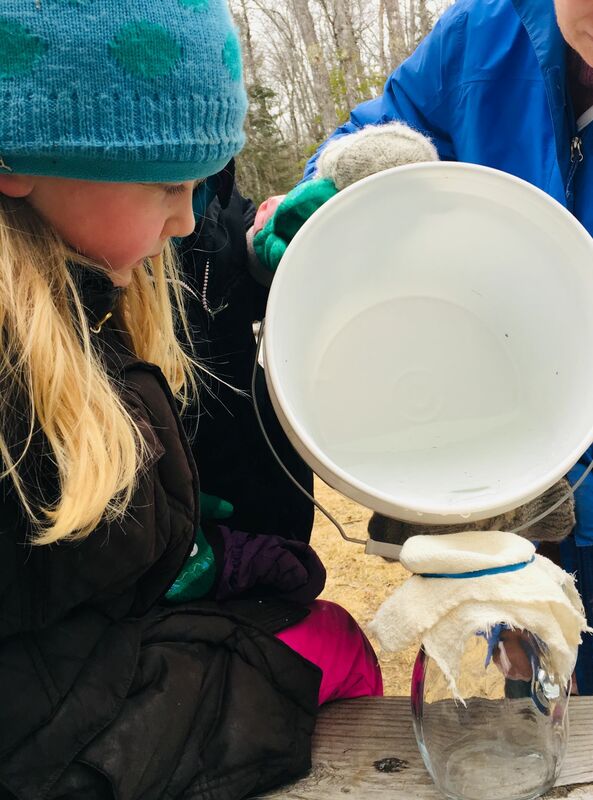 Some of the sap we boil down into syrup to drizzle on top of our rolls on Bread Day, while some of the sap we enjoy as a sweet drink…sometimes the children savor sweet drops right from the trees. We always give thanks to the trees for their generous gift of fresh, nourishing sweetness. This is a video of my puppet story that I tell for the children and parents in my parent/child (Morning Garden) group. The text is from Wilma Ellersiek’s book: Gesture Games for Spring and Summer. 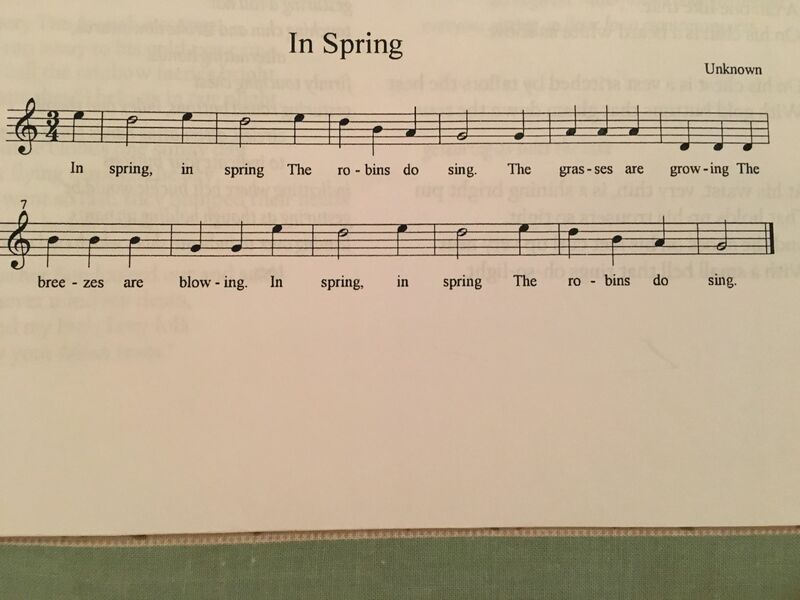 I adapted the animals from her text to fit in more with our environment in the springtime. For my Morning Garden children, who range in age from 18 months to 4 years old, I usually tell my puppet stories on the floor. Often the children like to wander in to watch me getting ready, so I keep the set as simple as possible, devoting attention to my gesture as I set up the scene. I tell the puppet story after snack, just before going outside. I retell the same story for the full Morning Garden session, adjusting the set as we move through spring…the white snow silk will gradually melt away, and new fresh branches/flowers will blossom. As it becomes a little warmer, I will bring the puppet story outside at the end of our morning together, setting up on a wooden platform by the edge of the woods. 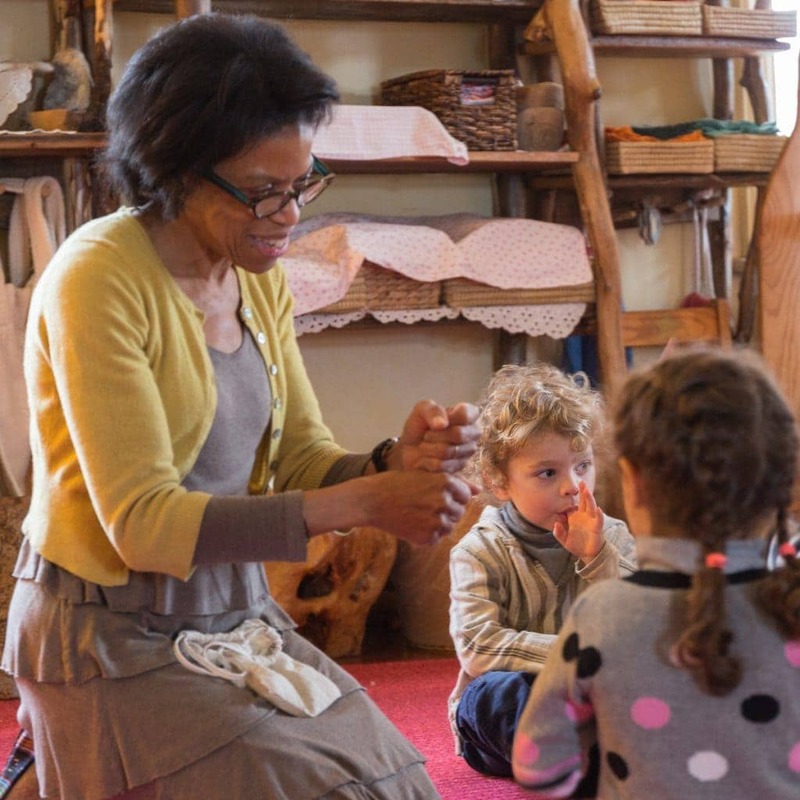 I welcome the children to the story each week by playing a pentatonic glockenspiel… the children know this is the time for them to finish up washing their dishes from snack, or to come from playing, if we are outside. Inside, I set up woolies (sheepskins) for children to sit on with their parents – soft and cozy, while also clearly showing a place to be. The underpinnings of the set are two small bowls for the hills, a curvy rocker board for the backdrop and a small length of wool batting I use for a smoothing base. I position the bowls first, upside down, then cover with the soft batting before laying down the silks. The rocker board works very well if I need a backdrop. It is such a versatile piece of equipment, both for the children in our program, and for us grownups! 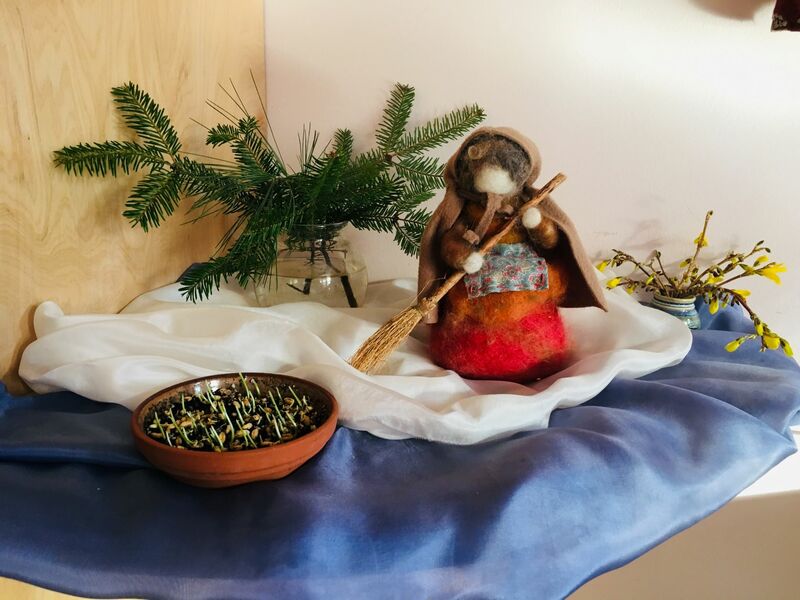 The children often like to bring over small felted animals from the nature table that I incorporate into the story, Squirrel and Mrs. Nutkin are favorites. These photos were taken two years ago. 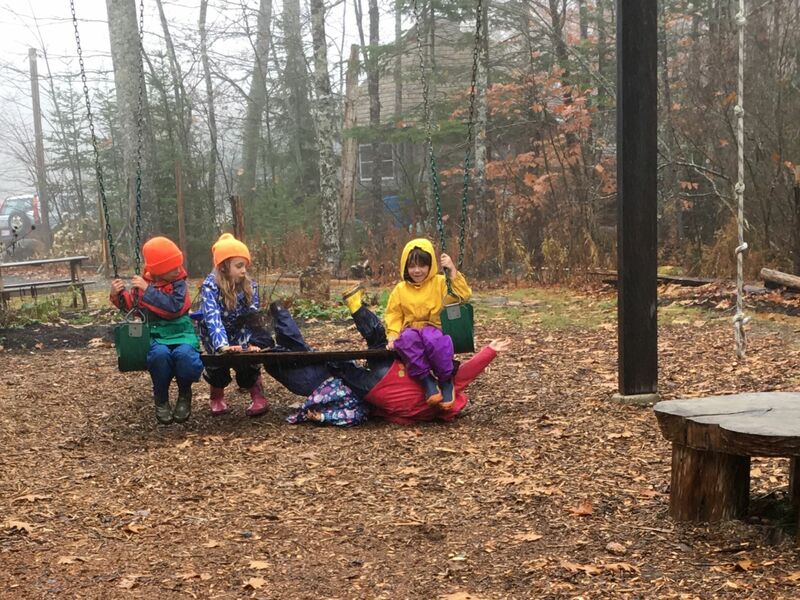 The children discovered how they could all swing together…and how they could help each other back up! One little girl, just four years old at the time, was observing this innovation from a distance. 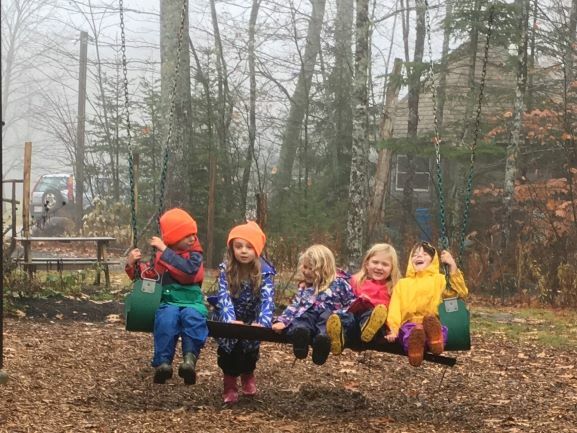 Last week this same girl, now six years old, led the way in finding a plank of wood to swing together with her friends. Rediscovering, anew. Discipline with Loving Awareness starts May 1st! Nurture yourself and the children in your care by joining Cynthia Aldinger, LifeWays North America’s founder and executive director, for this rich, inspiring online course! Discipline with Loving Awareness will help you fill your tool box with strategies and ideas for loving discipline that strengthens your relationship with the child. Begins May 1st! Click here for details! The story was so lovely! Thank you for this and for the inspiration it brings. Margot! Thank you for this beautiful unfolding of your life with the children (and parents) in this amazing season of newness! The lovely simplicity is profound, and the way you share makes us all feel we might be able to do this too! What blessed families to be in your care.